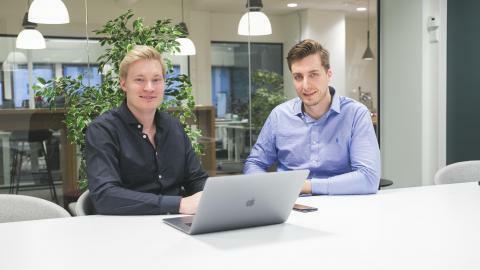 Deloitte Technology Fast 50 program lists the 50 fastest growing technology companies in Finland based on company’s revenue growth over the last four years. Lamia is ranked number four. Lamia's founders Lauri Järvenpää and Henri Halmelahti became friends in Reserve Officer School. They didn't have a clear vision of what they wanted to achieve in their future careers but were both mutually talented in the field of technology. Hence, they decided to start a company together. From the beginning it was clear that there are many companies in Finland that are left behind in the digital transformation and are in need of serious help. "It was pretty cool to hire our first employee, as at some point we thought that's something we can never afford. It feels crazy that now we have forty-something employees, let alone where we'll be in a year's time", Järvenpää grins. Lamia has never wanted to be a stereotype of a startup, in which there are more empty visions than actual business happening. Lamia started its journey with 2500 euros and has grown self-sufficiently during the past five years and is now at 4 million euros in revenue. In fast growth we still prioritize being self-sufficient so that we're able to move to different directions in an agile way. In companies that are heavily in debt the fear of failure is the driving force. The focus is too much on avoiding the mistakes than creating the growth elements. Due to the fact that Lamia is financially secured the company can invest for the future but, in addition, maximize employee commitment. If there's no security about the company future it's impossible to guarantee career development for employees. "No matter what, you still have to be humble. I've grown in an entrepreneur family in which I get reminded weekly that don't get attached to the current situation. It can be taken away in a heartbeat. This might sound brutal but it keeps me focused at all times", Halmelahti ponders. Järvenpää and Halmelahti admit to being free spirit. Their mentality has been the key factor in creating digital value for their client companies. "Many companies just follow the market leader which causes oversupply in the market and companies die. We aim at choosing the paths that others don't as that's where the real business is. Our agile business structure is a true advantage. Thus, we can create our client companies any kind of solutions without having to sell bulk. Actually we don't even start cooperations which we don't find profitable or interesting enough", Järvenpää admits. Lamia invest in quality solutions even though they might be harder or more expensive to implement. Working assembly lines could be cheap to implement and, in addition, it doesn't require a lot of expertise. However, we choose to spend more time and consideration on our recruitment so that we can deliver high-end digital solutions. This creates a permanent competitive edge in the long run. Technology is moving as fast as ever, which is why Järvenpää and Halmelahti cannot honestly say where Lamia is going to be in for example ten years' time. "We're fascinated by the finance sector and different payment methods. Just now it's extremely interesting how traditional banks are losing significance in payment due to PSD2. This creates endless possibilities for especially retail businesses", explains Halmelahti. Other increasing trends that influence the E-Commerce field are PWA, Open Source, Microservices and Cloud. Lamia is determined to provide its clients with all the latest solutions in digital transformation. "No matter how talented today's Business Directors and CEOs were, they're just simply too busy to commit fully to digital development. Hence, finding the perfect digital partner that has the knowledge and resources to analyze the data and develop the digital business strategy in an agile way is more important than ever before", argues Järvenpää.